The oxidation number of barium in barium difluoride is 2. 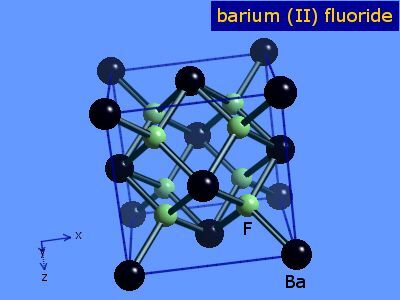 Barium fluoride is made by the reaction of barium carbonate, BaCO3, with ammonium fluoride. As barium fluoride is essentially insoluble, it precipitates out. The table shows element percentages for BaF2 (barium difluoride). The chart below shows the calculated isotope pattern for the formula BaF2 with the most intense ion set to 100%.